They are 100% natural and non-steroid creams which help relieve the symptoms of Lichen Sclerosus. Whether used alone or alongside other treatments they may help to reduce itching, pain, redness, and erosion of skin tissue. 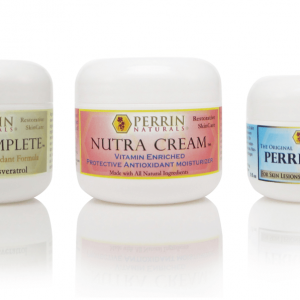 All three creams contain similar ingredients but represent 3 different strengths. Perrins Blend is very strong and harder to spread (but also the most powerful), Creme Complete is easily spreadable and still strong, Nutra Cream is a mild cream and can be used on highly inflamed and sensitive tissue. All three creams contain similar ingredients, however, represent 3 different strengths. 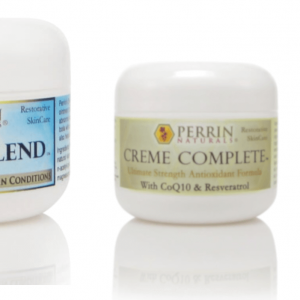 Perrin’s Blend is the strongest of the three products for use on Lichen Sclerosus. It has a base of activated honey so it is a thick, sticky, burgundy colored ointment rather than a cream. Again it is 100% natural and apart from the taste you could eat it. It doesn’t spread but will become more malleable once warmed by your skin. It can be used at night to help accelerate the healing process of Lichen Sclerosus. You can also mix some Creme Complete or Nutra Cream into the Perrin’s Blend to make it more spreadable. Creme Complete has many essential and natural ingredients that will support your skin and assist with rejuvenation and restoration of skin affected by Lichen Sclerosus. The many vitamin and antioxidant ingredients work to support your skin and reduce the symptoms of Lichen Sclerosus and other abnormal skin conditions. The skin requires nutrients for normal function and when skin is under stress it needs more antioxidants and vitamins to prevent inflammation and irritation. The ingredients of Creme Complete are easy to read and identify as natural (you could almost eat it) and these ingredients have been found to support the skin to heal, support healthy aging as well as being anti-viral, anti-bacterial, and anti-fungal. 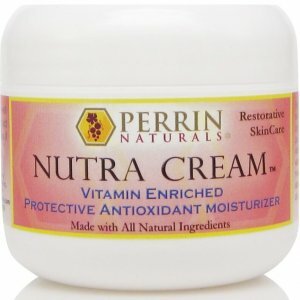 Nutra Cream is the mildest of the three products. Whilst it contains the same wide variety of vitamins and antioxidants as the Perrin’s Blend and Creme Complete they are at a lower concentration – making it a mild and soothing cream. This makes it ideal for those who suffer from highly inflamed and sensitive Lichen Sclerosus. Use Nutra Cream initially until your skin is less inflamed and then you can slowly introduce Creme Complete. 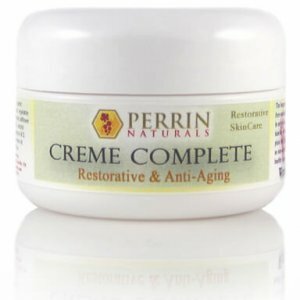 You can also use the protocol which many people have found relief of their symptoms which is Creme Complete during the day and Perrin’s Blend at night. Organic aloe vera, grape seed oil, organic beeswax, organic vegetable glycerin, organic cocoa butter, natural vitamin E in soy oil, organic castor oil, vegetable derived emulsifying wax, almond oil, organic safflower oil, organic extra virgin olive oil, honey, lavender oil, lecithin, vitamin C, n-acetyl cysteine, resveratrol, alpha lipoic acid, sodium bicarbonate, grape seed extract, coQ10, biotin, vitamin A & D, lemon oil, frankincense oil, peppermint oil, geranium oil, cornstarch, cream of tartar, and rice flour. Pure Honey, Grape Seed Extract, Ascorbic Acid (vitamin C), Natural Vitamin E, NAC (N-AcetylCysteine), Grape Seed Oil, Alpha Lipoic Acid, small amounts of Magnesium Sterate (non-caking agent for vitamin E) and rice flour. Grape seed oil, organic extra virgin olive oil, sweet almond oil, organic safflower oil, organic castor oil, pure aloe vera, pure honey, organic beeswax, organic vegetable glycerin, grape seed extract, Vitamins A, C, D, & E (in soy oil), alpha lipoic acid, biotin, N-acetyl-cysteine, lecithin, cream of tartar, sodium bicarbonate, corn starch, rice flour, peppermint oil, lemon oil, & lavender oil.